Brandon represents numerous clients in a wide range of industries throughout the U.S., with a focus on counseling manufacturers in distribution-related disputes. He has significant experience working with automotive and powersports vehicle manufacturers to address issues that arise in their dealer networks. Regardless of the industry, he seeks to obtain the best possible result to advance his clients’ business interests. 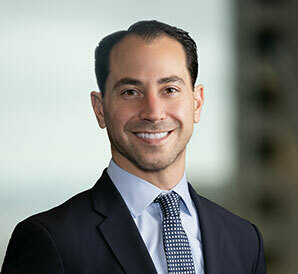 In addition to his work with manufacturing clients, Brandon also advises other corporate, banking, and real estate companies on a variety of commercial litigation matters. He has litigated numerous cases in federal and state courts and state agencies throughout the U.S. His time in Procter & Gamble’s Finance & Accounting division — prior to his legal career — gives him a business perspective that clients don’t often find from outside counsel. Brandon regularly counsels motor vehicle and powersports manufacturers on general dealer network initiatives, such as incentive programs, sales policies, facility programs, and specific disputes concerning their dealer networks, dealer agreements, and the federal and state regulations affecting the manufacturer-dealer relationship. Clients also look to Brandon for guidance on initiatives to improve dealer performance and strengthen dealer networks. Facility and corporate identity initiatives. Terminating a dealer after it lost its floorplan line of credit. In any dispute, Brandon pursues the most productive strategy for his clients, whether that means aggressively pursuing cases through trial or hearing, or negotiating a business-oriented resolution. Motor vehicle manufacturers also look to Brandon for counseling on other dealer network matters, including dealer ownership and management changes, manufacturer rights of first refusal, vehicle allocation, sales performance standards, customer satisfaction programs, and other initiatives to strengthen the dealer network. For example, over a five-year period, Brandon managed a sophisticated dealer improvement program for a manufacturer with a large dealer network. The program helped the client achieve significant sales gains and an improved dealer network. When not attending to his client’s needs, Brandon has enjoyed serving in several leadership roles in the Chicago Jewish community. You may also find him enjoying a cold Northeast IPA, possibly between sets at one of Chicago’s renowned music venues. He and his wife are avid Cubs, Blackhawks, and Bears fans, and they enjoy seeing what new milestone their young son reaches next. Newton Volkswagen v. Volkswagen of America, Inc. Represented Volkswagen in state court action challenging termination of dealership. Summary judgment in favor of Volkswagen. Represented Lamborghini in state court termination action. Summary judgment for Lamborghini. Low Country Volkswagen LLC v. Volkswagen of America, Inc. Represented Volkswagen in South Carolina federal court action seeking $8 million in damages for alleged coercion in connection with dealer’s obligation to build facility. Jury verdict entered for Volkswagen on all counts. Marker Oil Co., Inc. d/b/a Marker RV and Power Sports v. BRP US Inc. Represented BRP US, Inc. in state administrative termination protest. Represented FCA US LLC in state administrative protest involving change to area of responsibility. Represented FCA US LLC in state administrative protest involving incentive program chargebacks. Represented FCA US LLC in state administrative protest involving supplemental dealership location. Represented FCA US LLC in state administrative termination protest. Volkswagen Group of America, Inc. v. Southern States Volkswagen, L.L.C. Represented Volkswagen in action seeking damages in connection with false incentive claims. Maxwell Volkswagen, Inc. v. Volkswagen of America, Inc. Represented Volkswagen in state administrative action challenging incentive program chargeback. Classic Automobiles, Inc. v. Audi of America, Inc. Represented Audi in New York federal court price discrimination claim challenging national vehicle incentive program. Beechmont Audi, Inc. v. Audi of America, Inc. Represented Audi in Ohio federal court action alleging price discrimination under the Robinson-Patman Act, the federal Automobile Dealers Day in Court Act, and the Ohio Motor Vehicle Franchise Act. Represented bank against property developer’s claims for breach of contract and fraud. Trial court dismissed both claims, and Illinois Appellate Court affirmed. Represented Plaintiff in claim brought in the U.S. District Court for the Northern District of Illinois alleging that the Defendants’ receipt of notices of intent to revoke permits from state regulators with respect to its licenses to operate three assisted living facilities in Georgia and Alabama violated a lease agreement with Plaintiff. On June 15, 2012, the matter was resolved with the Defendants’ agreement to pay $97 million for the properties at issue, $3 million for a litigation settlement fee and agreement to pay all of Plaintiff’s fees and costs associated with the lawsuit. Represented bank in guarantors’ appeal of district court’s entry of summary judgment for bank for breach of guaranty. Seventh Circuit affirmed summary judgment. Represented bank against borrower and guarantors in mortgage foreclosure matter. Judgment of foreclosure entered against borrower and summary judgment entered against guarantors. Represented receiver in claim brought in the U.S. District Court for the Northern District of Illinois against the directors and officers of AA Capital Partners, Inc., an SEC-registered investment advisor, in a $60 million claim for violations of ERISA, breach of fiduciary duty, fraud, and conversion arising out of alleged misappropriation and misuse of investor funds. Successful petition to the U.S. Department of Justice Immigration Court to grant asylum to an Iranian national who fled Iran after being targeted by the government for participating in the historic protests that followed the election of Iranian President Mahmoud Ahmadinejad in 2009. This appears to be one of the first U.S. asylum cases connected with the widely reported 2009 election protests in Iran. Successful petition to the U.S. Department of Justice Immigration Court to grant asylum to an Egyptian couple who fled persecution in Egypt on account of their Coptic Christian religious beliefs.